I have a friend whose brother works as a teacher in an area that is said to be experiencing some of the worst post-election violence. When schools opened about two weeks ago, he decided to stay away from there. After a while he thought it would be safe to return to his school, as he had heard no reports of violence there. He was abducted from his home on Monday night, beaten up and returned to his home. And the worst part was that he was given a "certificate" to show he had received his beating. Another friend of mine had an uncle who recently passed away. He told me he was debating whether or not to go to the countryside for the funeral. A number of farms have been attacked by "war veterans"
His parents had told him that "war veterans" in the area had set up road blocks, were stopping and searching all vehicles, and telling people travelling in from Harare to go back where they had come from. There is a good chance that warning would come after a beating they said. In the end, he decided to go and honour his uncle's memory, and face whatever he came across. He has not yet returned, so I do not know how he fared. People are saying this is what the run-up to the presidential election run-off is going to be about - violence and intimidation. The idea is to force supporters of the opposition to stay away from their homes so that on voting day they cannot cast their vote. There is no chance that these people are lying. The reports are too numerous and are coming from too many areas. For the urbanites, the struggle is - as always - with ever increasing prices. Public transport fares doubled over one week. Last Friday, a single fare was $50m, today, exactly one week later it is $100m. The list of what we thought were basics that have since become luxuries continues to grow. For example, laundry soap now doubles up as bath soap. You can do without bread, and grow your own sweet potatoes instead. If you cannot grow them, then buy them, they are still a lot cheaper. But this week, I do not feel so much for my people as I do for the Burmese. Cold, wet, hungry and homeless as their leaders think about whether or not to accept foreign aid. The suffering ordinary people have to endure as the world respects sovereignty is beyond belief. Q: Esther, what makes you think Tsvangirai will change Zimbabwe's economic crisis in the country? A: He has an economic recovery plan to resuscitate the economy and he is willing to re-engage the international community.National pride is all well and good, but no economy can survive without trade with other nations. Q: In your last diary you talked about how Morgan Tsvangirai has an economic recovery plan, but has he talked about how Zimbabwe can improve the production of goods and services, and if he has, how is his economic recovery plan going to promote this? A: I would be doing it an injustice to comment on its contents, I just know it exists, and it talks of restarting the manufacturing industry. Q: Now that the 'verified' results have been announced and the MDC is still pondering whether to go for a run-off, what do you think the MDC leadership should come up with now, given the fact that the military are poised to shoot to kill any opposition leader who will be in their sights? A: Can they come up with anything? Even if they do, they cannot even communicate effectively with the people. Local TV & radio media are 100% Zanu-PF. I think they are stumped. This is why they are flying from one country to another, keeping Zimbabwe in the spotlight - they do not know what else to do. Home is unsafe, and not just for them, but for all their supporters. Q: We get reports of people being intimidated by war veterans etc in rural areas and either being beaten for voting opposition, or being warned that if they vote opposition they will be attacked. The question I have is, how do they know which people or which villages voted for the opposition or for Mugabe? Is the vote not secret? A: Remember this election was actually four in one - Senatorial, Parliamentary, Council & Presidential. The country was divided into constituencies and those are futher divided into wards for the Council election, and one could only vote in their ward. Wards are pretty small, especially in the rural areas. So it is very easy to see how a ward voted, and this is what is being used. You can never again tell the rural electorate that their vote is secret, we have all seen that it is not. Q: What happens to Zimbabwe if Zanu-PF happens to win a re-run, are you going to wait and see Zimbabwe being destroyed for another five years? A: I pray it does not come to that, but if it does, I give up and they win. I could not live through another five years of this. 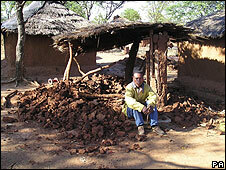 Q: It seems to me that the situation has gone way beyond the point you Zimbabweans can bear. How come some 43% of the population still voted for him? Zimbabweans had a golden chance of getting rid of this tyrant but you threw it away. You gave him votes again. How can the outside world intervene in these circumstances? A: We in the urban areas could not believe it either. It looks like he still has support, especially in the rural areas where people survive on subsistence farming, have never had access to running water, electricity, fuel, paved roads etc. They do not see how the infrastructure is crumbling. They still see him as a liberation hero, even though that's 30 year old news. Q: Esther, you are doing great telling the story from within. What we see on the media and read on the paper is not the same as coming from you, as someone who lives there. Where do you see yourself one year from now in Zimbabwe? A: I see myself living in a country where we are all working together to rebuild and restore our land. Where the political party you support is not a closely guarded secret lest it land you in hospital or worse. Saving to buy a new car, not an import with 10 000km on the dial already. Getting a mortgage to buy a house (you know there is no credit in Zimbabwe anymore, not even for clothes?) That is the dream, but it seems more & more unrealistic each day.